Many thanks for your efforts and especially to tamancha!! Based on a lot of research into Reilly's I can pretty definitively date the gun's manufacture from very late 1864 to early 1865 based on the serial number. According to the internet the Vikram Sanwat calendar if 56.7 years ahead of the Georgian calendar, making the date on the label around 1880 CE. I'm wondering if perhaps the gun was resold? The gun can be viewed here. tamancha wrote: The script reads .. Maharaj Pratap Singh ji Solarkar or Sarkar Palamau. Vaishak..(i.e April/May) Sudi 12 means 12 of April/ May..Sanwat 1937 means Hindu calendar Vikrami Sanwat 1936. that is 137 years old. 200 Silvers rupees paid to the seller along with some presentation. Brilliant, Tamancha! Thank you very much for the translation! I've posted a reply to the excellent responses above and again many thanks. This reminds me of a rather amusing story. General Palit and Lt. General Krishnan Sibal were married to sisters. General Palit's estranged wife was beautiful and intense. Suraya, General Sibal's wife, was the funniest and kindest person you could imagine. Well, General Sibal could not read Sanskrit. Suraya told me that early in their career when they were traveling in Haryana or UP, if they had a fight, she'd refuse to read the road signs for him. She also told me a story about the caves of Khajuraho. She and Gen. Sibal were touring the caves with an American military couple and suddenly she burst laughter. The American couple asked what happened and she pointed to an elderly couple behind them, dressed country style, the husband in a Doti, etc. with the wife walking with a cane. She was pointing at a relief sculpture with the cane and had said in Hindi, "You see that one? That's the one I've been trying to tell you about for 50 years." Suraya died in early 1990's - I still have a Christmas card she sent us and put it on the tree every year. General Sibal, like General Palit, had been in the pre-WWII Indian Army. General Palit was in India on the Burma front for the war, General Sibal was wounded in Italy in the assault on Monte Cassino. In 1997 I called him from Italy...it had been 5 years since I had spoken to him. I said, "General, guess where I am. I am right on top on Monte Cassino at the monastery and Good God - how in the world did you guys even get as far as you did." He said he could see the mountain in his mind's-eye even then. General Sibal was an excellent golfer. General Sibal had been in command of one of the Indian divisions attacking Lahore in 1965. The division was an organizational mess when he took over and he had to sack half the officers and non-coms. He commented, "You only get to shell Lahore once in 100 years so I shelled the hell out of it." Gen. Palit though privately said that per his analysis, the Indian Army assault on Lahore had been pretty disorganized and bungled. His Gurkha regiment never got into the fight though it was transferred late in September to reserve status near the front. General Palit never wrote a book about the 1965 war - he did about 1971: "Lightning Campaign." https://www.amazon.com/gp/product/18978 ... taft_p1_i0 . However, I believe he wrote observations about his role in his autobiography, "Musings and Memories." I need to get that second volume somehow. Again accounts of the 1965 war (and I discussed it in 1975-78 with Pak generals who were involved and had been brigaded with Gen. Palit and Sibal before the break-up of the armed services in 1947 - they used to meet each other in London each year for years) are very confusing and for the most part pretty self-serving. Argo44 wrote: Many thanks for your efforts and especially to tamancha!! Based on a lot of research into Reilly's I can pretty definitively date the gun's manufacture from very late 1864 to early 1865 based on the serial number. According to the internet the Vikram Sanwat calendar if 56.7 years ahead of the Georgian calendar, making the date on the label around 1880 CE. I'm wondering if perhaps the gun was resold? The gun can be viewed here. Hi Argo44 ..There was a raja in behar( Bihar) Raja Pratap Singh of Palamau. If I am not wrong the Palamau was not other than Palamu near Lohardagga District. Do research you will get about Raja Pratap of Palamau. Welcome aboard and I must say one of the most interesting first threads posted by a "newcomer"! Argo44 wrote: And I'll again make a plea that if anyone can locate Vol II of "Musings and Memories," I'll buy it. I've tried e-mail with publishers and local book stores in New Delhi. I did locate some sellers on Amazon though, see https://www.amazon.com/gp/offer-listing ... w&qid=&sr= their prices are on the higher side, but for an out of print book, what is one to do? Thanks, I went ahead and ordered it. When I became aware of the book a few years ago I ordered both volumes from an Indian bookstore. Only one arrived. I'd better avail myself of this now - the boys want it. General Palit had one peccadillo in the field; If a bird got up I'm front of him, it was his bird, now matter if it flew down the line in front of me. He informed me that it was protocol pounded into him by his original commander in the 10th Baluch when he was just our of Dera Dun in the 1930's. I never actually paid much attention to this custom. But about 1990 I was invited to a full dress anniversary celebration of the Presidential Bodyguard - Tuxedos with the bodyguard officers in scarlet with the chain-mail epaulets, and beautiful women in Saris including the Maharana of Jaipur, an incredibly handsome and highly-educated woman, when whom I was lucky to converse for almost an hour..she spoke fluent French and was familiar with the smallest details of France. The room was lit by candles and the regimental silver gleamed - very 19th century. In discussing hunting with the then commander (I can't recall his name and have misplaced the card but an impressive officer), he mentioned that Gen. Palit had been his first commander. He went hunting with the General and shot a bird which had got up in front of Gen. Palit and got chewed out for it. It's interesting how Indian Army hunting protocol got passed on from generation to generation. I will say that the Indian Army operated on generally different set of criteria from civilians. If there was a reception, the Indian officers would arrived on the dot-literally on the minute...the businessmen anywhere from 45 mins to 2 hours late...which often gave me a chance to talk to them for an hour before the rest of the guests showed up. And this different way of doing things created some tension which probably had existed forever. The businessmen resented the place at the Delhi Golf Club reserved for the military - the military thought businessmen, no matter how rich to be lower status in life. Ah...social divisions...it's always interesting. I suspect things have changed in the last 30 years. Today is Thanksgiving in America - it's a neat holiday - Happy Thanksgiving to all of you. And one more story of hunting in Haryana and UP in the vicinity of Aurangpur. The people of the area were mostly vegetarian and didn't much like hunters although General Palit had pretty much of a Laissez Passer. Nevertheless, he often stationed a Shikari at the Jeep to prevent the air from being let out of the tires. It really didn't much matter - because the thorns in that area were so long that I'd invariably come back with a couple of flats. The gas station near Shanti-Niketin in New Delhi did a good business repairing the tires. If you all could take a look at that second label posted above, would much appreciate it. Also, I'd like to send a private message to "Pelle" but can't figure out how to do it. Happy Thanksgiving to you too, Argo. Where is the second label posted? Could you please post it again? 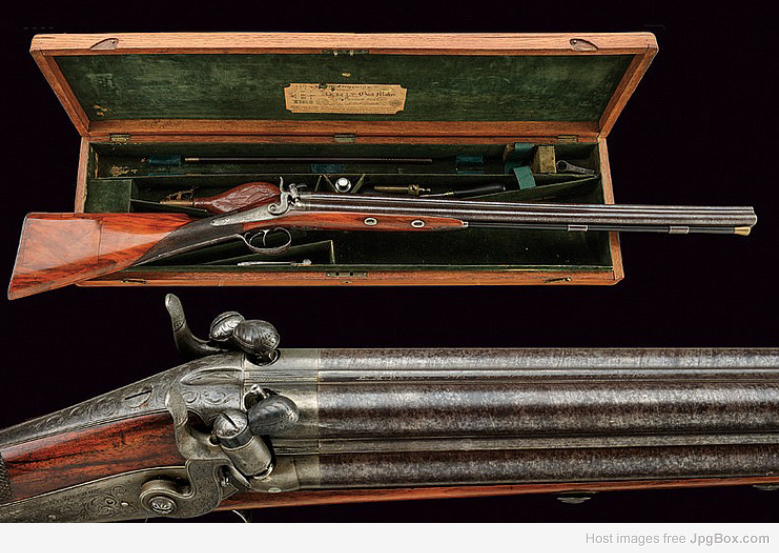 This is from a pretty incredible four barrel shotgun with Damascus barrels. 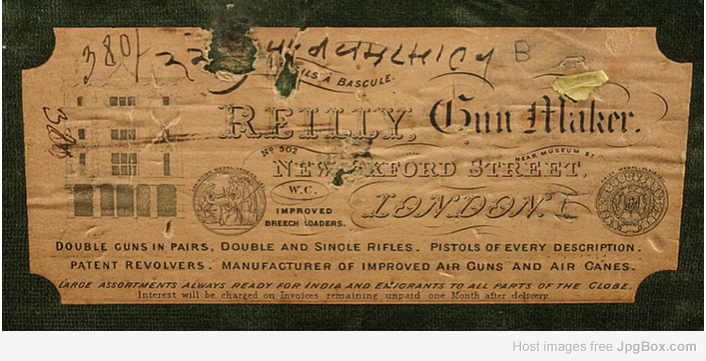 The gun has "E.M. Reilly" on the rib (post October 1859), but the label has "Reilly" and the drawing of 502 New Oxford Street and the two medals won at 1851 Crystal Palace Exposition and 1855 Paris Universelle. But the kicker is - no Serial Number; meaning it wasn't numbered in the Reilly chronology - thus should indeed have been built between 1856 and Fall 1859.